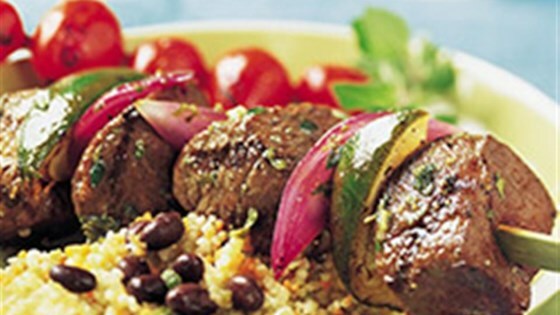 "Cubes of steaks are threaded on skewers with lime and onion then grilled to perfection. A sauce of citrus, herbs and spices provides the finishing touch." Place kabobs on grid over medium, ash-covered coals. Grill tomato kabobs, covered, about 2 to 4 minutes or until slightly softened, turning occasionally. Grill beef kabobs, covered, 8 to 10 minutes (over medium heat on preheated gas grill 9 to 11 minutes) for medium rare (145 degrees F) to medium (160 degrees F) doneness, turning once. Summer tastes so good with grilled kebabs!